This is another one of those mysterious grave markers in Zion Chatt’s cemetery, one of a handful of tombstones in the cemetery that marks the final resting place of someone about which nothing is recorded or known. Neither her death nor her burial is recorded in the church records. In fact, she is not mentioned in the church records at all. Not even in the communion records. Very few individuals with the surname Schaeffer, or other spelling variations of that name, are mentioned in the Zion Chatt’s records. It just was not a common surname around the Chatt area. In addition, her death does not appear to have been recorded in Mercer County Probate. Catharina’s grave marker is badly weathered and very difficult to read. 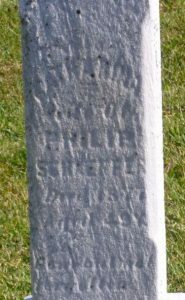 When the Mercer County Chapter OGS read the cemetery in 1990 they transcribed a word in the second line of the inscription as “dau” [daughter] of Philip, but Find a Grave.com records it as “wife” of Philip. That would certainly make a big difference. Was Schaeffer Catharina’s maiden name or was it her married name? Was Philip her father or her husband? Where was Catharina Schaeffer in 1870? 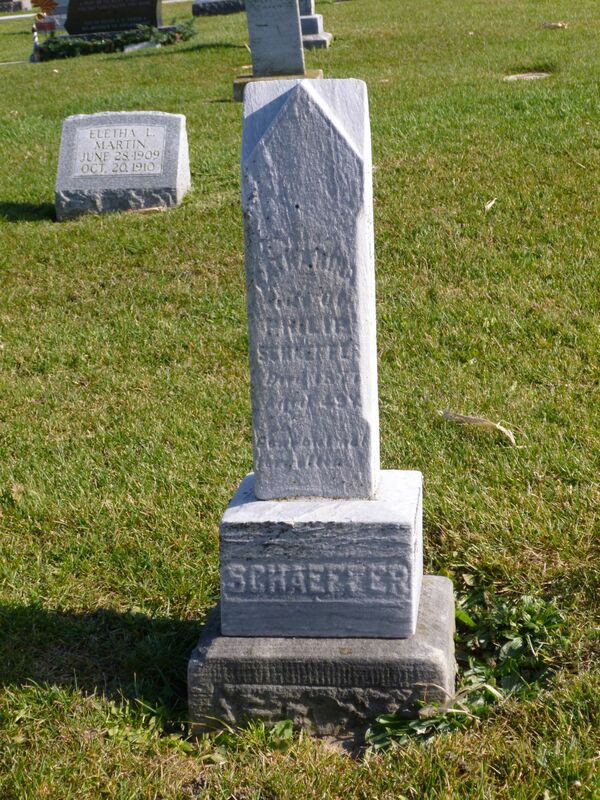 There were a couple Schaeffers/Shaffers living in the area at that time. 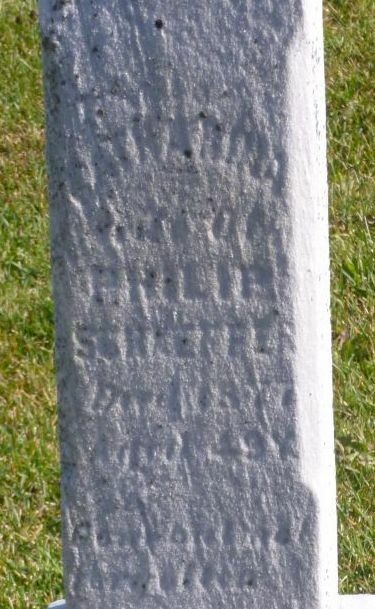 There was a Catharine Shaffer living with the Christian Beinz family in Dublin Township in 1870. She was 50 years old, not a very good age match for our Catharina, but census enumerations are notorious for their age ranges. That Catharine lived closer to Chatt than the 57-year-old Catharine Shaffer living with the John Shaffer family in Gibson Township in 1870. Again, the age is a problem. And what about Philip Schaeffer? My heart skipped a beat when my search for him came up with a Phillip Shaffer (1834-1902), born in Ohio, a physician who lived in the Wabash, Indiana, area. Another Zion Chatt Cemetery mystery immediately came to mind–Dr. Benjamin Franklin Edgington, his wife Eliza, and his daughter Carrie (Edgington) Eichhorn Friedell. Déjà vu. Could this be the burial place of yet another physician’s wife? No. This was not the person I was looking for. Dr. Phillip Shaffer probably never practiced in Ohio and he was not married to a Catharina. 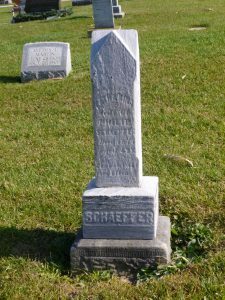 There is at least one Schaefer mentioned in Zion Chatt’s records–Anna M. (Schaefer) Grauberger, who is also buried in Zion’s cemetery. Anna is buried next to her husband George Adam Grauberger. If you go with the “daughter of Philip” inscription and if Schaeffer was Catharina’s maiden name, I would look at Anna Schaeffer’s family, wondering if the two women might have been sisters. Their ages would have been close enough. Anna was born in 1833 and Catharina was born about 1828. More information is definitely needed for this one.